Father Gregory Gerrer, a monk of St. Gregory's Abbey in Shawnee, Oklahoma, achieved an international reputation as an artist, curator, and collector of art. Born Robert Francis Xavier Gerrer on July 23, 1867, in France in the Alsatian village of Lautenbach, during the Franco-Prussian War of 1870–71 he immigrated with his family to the United States. They settled in Bedford, Iowa. As a youth he displayed a talent for art and music, taking various jobs as a musician. Upon learning of a land opening in Oklahoma Territory in 1891, he traveled to Guthrie. In December he visited the community of Benedictine monks at Sacred Heart Mission, located in the southern part of present Pottawatomie County. He remained there and entered the novitiate in January 1892, taking the name Gregory. After being ordained to the priesthood in 1900, Gerrer traveled to Rome to study art. During this time he developed a reputation for portraiture. In 1904 he painted a portrait of the recently elected Pope Pius X (canonized 1954). Gerrer entered the painting in the 1904 World's Fair at St. Louis, and it won a bronze medal. The original of this signature work is exhibited in the Mabee-Gerrer Museum of Art on the campus of St. Gregory's University in Shawnee. 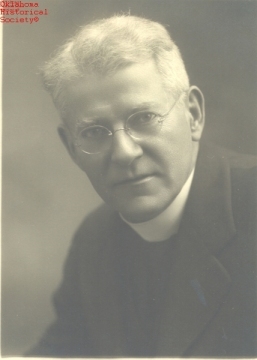 Gerrer returned to the United States in 1904 and taught at Sacred Heart and at St. Gregory's, after the Benedictine community moved to Shawnee. Beginning in 1917 he spent fifteen years as a faculty member and curator at the University of Notre Dame in South Bend, Indiana. He then returned to St. Gregory's Abbey and resumed his teaching duties. He also continued to paint, both for income and to barter for artistic works and anthropological objects. Throughout his career he collected the art and artifacts that became the nucleus for the Mabee-Gerrer Museum of Art. He was cofounder and first president of the Association of Oklahoma Artists. In 1931 Gerrer was inducted into the Oklahoma Hall of Fame. He died on August 24, 1946. Gregory Gerrer, "Memoirs of Rev. Gregory Gerrer, O.S.B," Archives of St. Gregory's Abbey, Shawnee, Oklahoma. Joseph F. Murphy, Tenacious Monks: The Oklahoma Benedictines, 1875–1975: Indian Missionaries, Catholic Founders, Educators, Agriculturists (Shawnee, Okla.: Benedictine Color Press, 1974). Nicholas Ast, "Gerrer, Gregory," The Encyclopedia of Oklahoma History and Culture, https://www.okhistory.org/publications/enc/entry.php?entry=GE011.